Venison tenderloin on a roll. Yay. Except this party food is about more than bread and meat. There's a bourbon gravy involved. Super quick; super easy. It takes all of 10 minutes to prepare the venison. The concoction involves a gravy. The trick is to be super fast, not overthink the process and do not — DO NOT — overcook the venison. Rare is right. Keep things simple when flavoring the meat by salting each side and adding a bit of pepper. Allow the cast iron and oil to get hot enough so once the meat is added there is quite a bit of smoke and sizzle. Set out the tenderloin and allow the meat to reach room temperature. Pat it dry. Salt and pepper all sides. You'll need a cast iron skillet. Use it on the stove eye and then transfer it along with the seared venison straight to the oven. It's important to allow the iron and oil to get hot enough so once the meat is added there should be quite a bit of smoke and sizzle. This isn't so great for the kitchen, but great for the meat. Make sure the fans and exhaust are set to high. Once the meat is in the pan, it'll brown quickly. All you're aiming for is a nice, brown crust on the outside layer. Turn the tenderloin until the crust is formed on all sides. 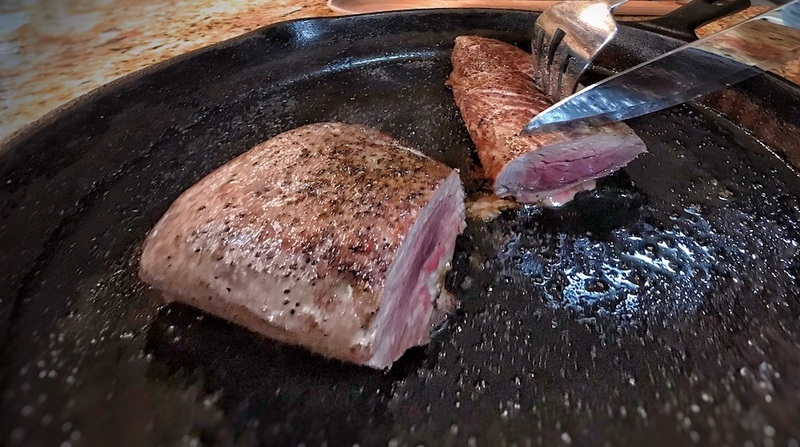 Once seared, remove the skillet from the stove eye and place it in the oven for 7-10 minutes depending on the size of your tenderloin. The venison should come out tender with a nice, pink center. The bourbon-maple gravy used for the venison rolls is a recipe posted by the brilliant Hank Shaw. He adds Tabasco to his gravy, I opted for horseradish (which I highly recommend). Either way, without some heat, the gravy is rich and sweet— arguably overpowering. The heat offsets the sweetness and makes things balanced. Pan drippings (if there are any), about 3 tablespoons. If short, add butter. Making this gravy is just like making any other gravy. It involves letting your grease or butter get hot enough so if you flick a bit of flour in the skillet it'll pop. Once the butter is hot enough and you add the three tablespoons of flour, you want to stir it constantly until you have a paste-like texture. That's when you add your other ingredients. Hank Shaw does a great job of simplifying the art of making the bourbon-maple gravy, without getting too longwinded. Go here for his instructions.